You can’t leave the house these days without tripping over someones selfie stick. However, selfie sticks do get round the evolutionary problem of homo sapiens not having arms long enough to hold a camera at arms length to take a self portrait or video. 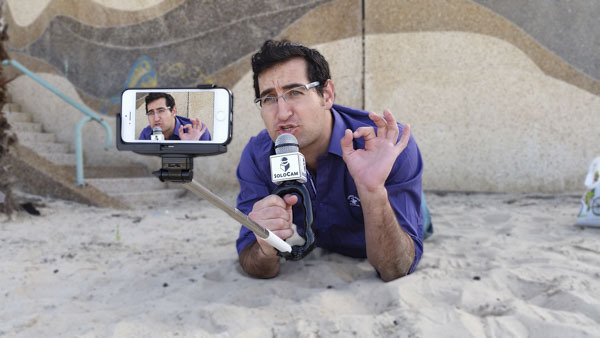 Jokes aside, the humble selfie stick can be a useful video tool. You can use it to take low and high angle shots really easily. They can double up as monopods, you can even record yourself presenting to camera. The trouble with that last point is the sound – you are standing a metre or so away from your phones tiny microphone. And then along comes the SoloCam. The premise of the SoloCam is very simple; a good quality selfie stick, with a microphone built-in to an easy to hold handle. The microphone records the audio via bluetooth, whilst a joystick on the easy to hold microphone/selfie-stick handle allows the operator to control the SoloCam app. The app itself has some cool features, including special visual and audio effects, but most usefully it has a teleprompter (autocue) so you can get your words right everytime. You can even live stream. The final neat little trick up its sleeve is that the bas of the stick can rotate around the microphone/handle, creating a sweeping shot around you as you present to camera. The SoloCam was launched on IndieGoGo, where it has now reached it funding goal. Impressively the basic device costs $49, plus shipping, which is a small drop in the ocean if you are a serious video blogger. We are hoping to get one in for a full review in the next few months when the device starts shipping.